I often have to work from old, unfocused or off-centered photographs. For my friend Julie, I had no photograph to work from! Julie only had an image from her Brother’s website. He is an Owner and Architect of Chesapeake Architects. He renovated his own home as a project for the firm. Julie is often pressed to find a Christmas gift for him, as he is a self-proclaimed perfectionist. 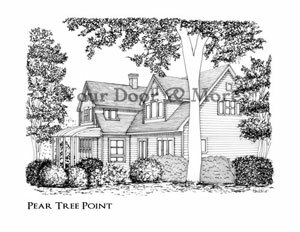 I was able to work from that .jpg image on his website to create a beautiful hand-illustrated home portrait of his personal love, his own home. If you don’t have photographs, please let me know, there are all kinds of ways to get a photo!